Retail Price: $18.00 Log in for LOWEST PRICE! 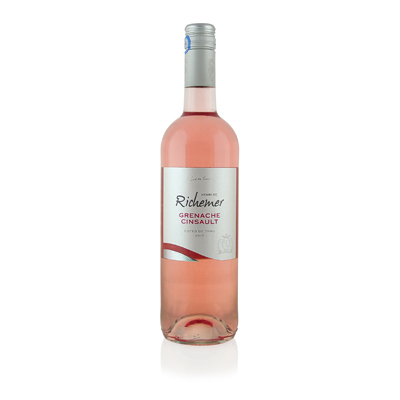 Richemer is a relatively new co-operative in Provence, founded in 1998. It is based in the Cotes de Thau area, located within the H?rault appellation. It is west of Marseilles, nestled on the Mediterranean Sea. The proximity to the second largest lake in France, Etang de Thau, influences the vineyard's climate. Etang de Thau is the largest in a string of lagoons that stretch from the Rhone River to the foothills of the Pyrenees and accounts for a very subtle moisture component, adding delicacy to the wines. The appellation neighbors the Rhone Valley, which shares many of the same grapes as this selection, such as Grenache and Cinsault. This area is legendary for Rose wines, and it's easy to see why. Rose can be made in two different ways. You could take some white wine and add a little red to it and voil?! You have Rose. They can't do that there; they'd get arrested. French winemakers use the second method of making Rose. They gently crush the grapes and allow a small amount of skin contact to achieve a pink hue. It may only be a few hours, so one must pay close attention to the process. As a result, they preserve the fresh fruit of the grape with just a little bit of tannin from the skins. Flavors of strawberry and kiwi abound here, complemented by peach and a lovely citrus finish.